The best of Western Montana is at your doorstep with stunning views of Mount Sentinel, Mount Jumbo, the Rattlesnake Wilderness Area, Pattee Canyon Recreation Area and even Snowbowl Ski Area. All this with the bonus of first-class dining and a historic theater under the same roof! This fully remodeled loft has been designed with your comfort in mind while using the latest in entertainment technology and “green” building materials and techniques. Keep warm with radiant tile flooring in the bathroom and sustainably harvested bamboo flooring throughout. All new appliances, concrete countertops, rich lighting, and integrated audio/video/internet components compliment the region’s natural beauty. 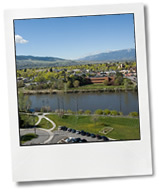 This is the perfect place to stay when you are in Missoula for business, summer or winter vacations, fly fishing, kayaking/river-rafting, University of Montana Grizzly football games, book or film festivals, visiting nearby family, weddings, or for any other reason you find yourself in beautiful Western Montana. With packages starting at $130/night (non-peak season), staying in the Wilma Condo is more affordable than most downtown hotel rooms. Here you'll be staying in style on the top-floor of one of Missoula's most romantic & historic buildings.